Last day to join the Nutriplus Cookbook “Think out of the shell” cookbook. ONE will be given away. Click here to find out more! Quick, don’t miss out the chance! I’ve been cooking alot recently if you see my tweets or updates in facebook (or even the frequency of recipes here) I used to cook alot when I was in Sydney (actually only the first half of the year) cause very often, the portion’s really big and to finish up the entire plate alone, is quite ……. fattening lol… I lived in North Strathfield for a couple of months in Sydney and my favourite place was the Harris Farm Market. It was the same street where my apartment were and probably about 5 minutes walk (if not carrying any groceries) They have the freshest mushrooms and spinach leaves and… I used to buy lots of ricotta cheese to make pancakes and stuff .. It was really cheap ($ to $ ok).. OKay, back to the recipes..
1. Heat wok and add in about 3 tbsp of oil. Saute garlic and shallots until fragrant. 2. Add in shrimps, tomato, cabbage and sambal. Stir fry for a minute or so. 3. Add in noodles and the seasoning, stir well. Add in bean sprouts last, and water if needed. Cook and stir-fry for another 2-3 minutes, add salt and pepper to taste. 1. Heat wok and add in about 1 tbsp of oil. Saute garlic till fragrant. 2. 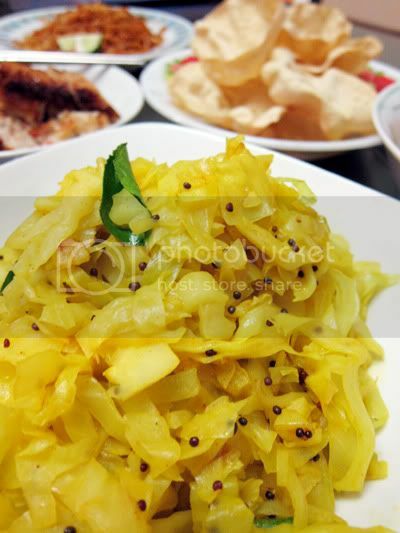 Add in cabbage, mustard seeds and toss toss toss. 3. Add in tumeric powder and curry leaves. Add some water to moisten the cabbage. At this point, I usually just close the lid, lower the heat and let it cook for 2 mins. Add salt and pepper to taste. I don’t know if you can see the plate of pappadums behind the cabbage.. To cook pappadums, it’s very easy. Spray cooking oil lightly on the pappadums, put them in the microwave and cook high heat for 15-20 seconds. There you have it !! 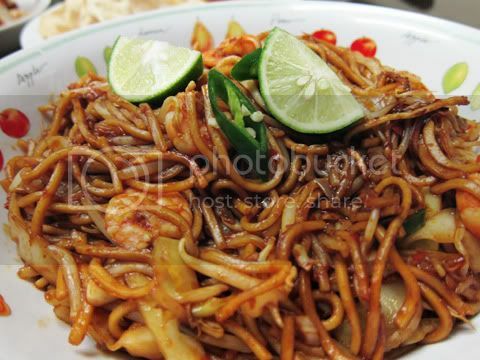 You have to spray some oil on the pappadums otherwise it will not be crispy and it will be soft after 5 minutes..
« It’s all about the moneh..
A plate of that mee goreng sounds just good! I've been to Eastwood a couple of times when I was in Sydney visiting a friend. Yeah, so many Chinese food there.